CTR’s Betty and Harold “Doc” Burton Family Fund for Veterans helps to underwrite 100% of lesson costs for veteran groups seeking services. Since we don’t want financial challenges to be a barrier to the benefits of riding, CTR established this fund in 2019 to give a “leg up” to veteran groups. (Read more about the fund below.) If you would like to make a restricted gift of support to the Betty and Harold “Doc” Burton Family Fund for Veterans, kindly note this fund on your donation check’s memo line, or in PayPal’s comment box. Thank you! Those are just some of the words we hear when veterans are participating in adaptive riding lessons at CTR. Our horses are the reason why veterans can experience healing. With an average of 22 veterans committing suicide each day, programming like this changes lives. CTR is currently serving the Mental Health/Residential unit from the VA Hospital in Perry Point, whose veterans are in a recovery program. 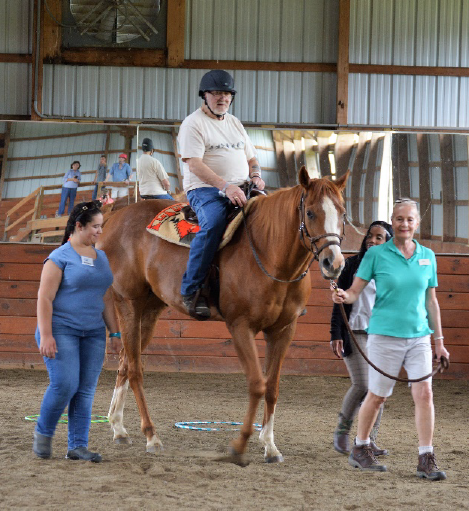 We are providing programming to veterans with basic horsemanship/adaptive horseback riding lessons. The program participants are dealing with PTSD, Military Sexual Trauma, Anxiety, and recovery from substance abuse. We also are serving a small group of veterans from the Long-term Care Unit at the VA Hospital at Perry Point. These veterans suffer from dementia, as well as the other effects of old age. This program supports and promotes healing for this special group of veterans while honoring their service to our country. Why horses? Horses live in the moment and they give real-time feedback to the veterans. They are not judgmental and have no expectations beyond what they are experiencing at that time. The veterans can just be themselves and spend time partnering with an animal in the outdoors. The time we spend with the veterans is filled with fun and fellowship. Their willingness to learn and be part of the herd has been inspirational to all. Despite receiving federal funding through a VA grant, the need is still greater than CTR can meet because there is not enough funding to provide our support services for all who seek it. Additional departments at the VA have contacted CTR to begin programming with their veteran populations. The grant cycle is yearly, and we have a gap in funding since the Veterans Administration covers very little, if any, costs of services deemed recreational. We established the Betty and Harold “Doc” Burton Family Fund for Veterans in 2019 to gather donations in any amount to cover the cost for therapeutic/adaptive riding lessons for veterans. Each two-hour lesson costs $120 when you factor in staffing, horse expenses and overhead. Doc Burton is a local World War II veteran who has been involved with CTR since our inception and has been the inspiration for this programming. Doc was an equine veterinarian and a Captain in the Army, responsible for caring for the horses while being shipped to Europe. He never forgot the service members who returned home after becoming shell-shocked during the war. He felt fortunate to have been discharged relatively unscathed and vowed to do what he could to connect veterans with horses. As people committed to honoring veterans, I am hoping you will consider donating to our Betty and Harold Burton Family Fund for Veterans to afford as many veterans as possible with a life-changing interaction and healing with our CTR herd. CTR changes lives but support from our community is essential! When you give to CTR, you are giving an opportunity to heal and experience joy to those men and women who have honorably served our country!